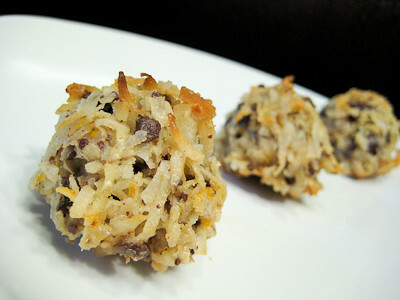 This week's Sweet Melissa Sundays (SMS) recipe was chosen by Ellen of Blue Tree Green Heart: Chocolate Orange Macaroons. 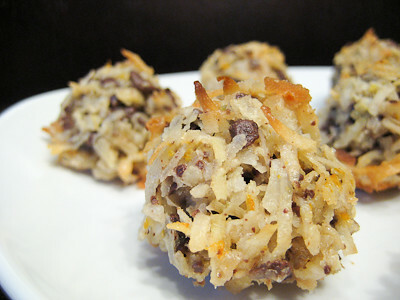 I love coconut, and so does my husband, so making this recipe was a no brainer. I also love chocolate infused with orange. Plus, it doesn't hurt that this recipe only takes a few minutes to come together - a bonus these days for this busy mommy! The recipe is short and sweet. Rub the zest of an orange with some shredded coconut, then add some sugar and chopped chocolate, and mix with egg whites. Scoop and then bake! That's it! The only thing I did differently was that I chose to rub the sugar in with the zest as well, instead of just mixing it with the chocolate. I figured that would give the macaroons an even stronger orange flavor. These came out perfect! Crisp on the outside, chewy in the middle, with bits of chocolate and plenty of orange flavor. Some found these to be a bit too sweet, and while you could probably decrease the amount of sugar in them to cut back on some calories, I didn't find them too sweet at all. I'll definitely be making these again and again! They're a great way to use up egg whites after all the ice cream I've been making this summer and much more fun than angel food cake. Thanks Ellen, for hosting this week. If you would like the recipe, you can find it here. Make sure you check out the Sweet Melissa Sundays Blog Roll to see how everyone else enjoyed these delicious treats. 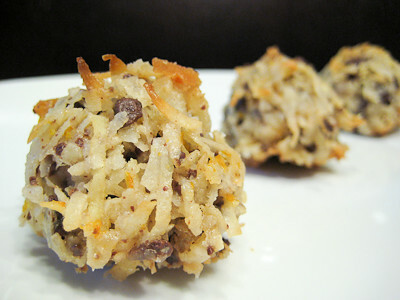 - I used semisweet chocolate chips in this recipe instead of bar chocolate. - If you tend to prefer cookies that aren't super sweet, use unsweetened coconut or decrease the amount of sugar in the recipe to one half cup. - I used a medium cookie scoop and got about 36 cookies, not 24 from the recipe. - Keep a close eye on these to prevent them from burning - mine were done a few minutes early, around 22 minutes. I so have to try these. They look fantatic! I might just make them for our Luau coming up! Thanks! Yum, yum, yum! Chocolate and orange together are delicious! I can't wait to try these. Mmmm wow these look so good!! Cravings heheh!! Beautiful cookies! I agree, it was nice to have a quick and delicious recipe. Your macaroons look fantastic Jaime! I agree - these are way more fun than angel food cake :) Unfortunately, I'm not a huge macaroon fan, but if I can find someone to take them off my hands I know exactly what I'll be doing with my leftover egg whites this summer! You know I've never had anything orange and chocolate. Guess this is a sign seeing as I have several eggwhites in the freezer. LOVE coconut so yes this is a no brainer I will most definitely make!! I loved this recipe as well. I also used chocolate chips, though the feedback from everyone was to omit it next time. Darn purists! This is something that's been on my mind for a long time now. Bookmarked. Your macaroons look great! Perfectly golden. I love chocolate and orange! Such a great combo.